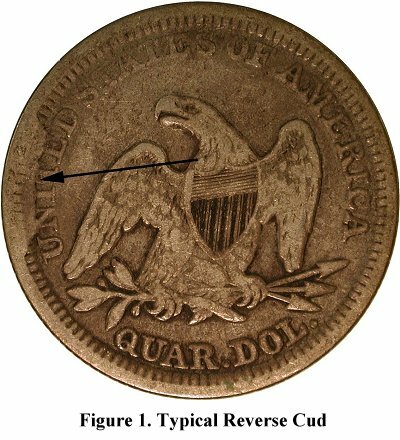 Those who look for cuds on Liberty Seated Quarters are usually familiar with the 1856 reverse cud shown in Figure 1 below. Despite being unlisted in Briggs and not appearing in the Gobrecht Journal thus far, it is fairly available in lower grades and can be found with patience. It is easy to think of such coins as the last struck from their particular die; to speculate that mint workers saw coins with cuds coming off the presses and changed to a newer die. 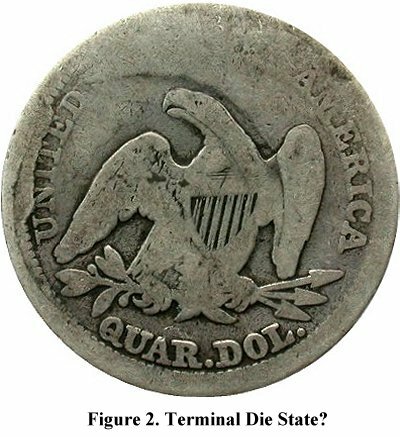 It seems, though, that at least in some cases the practice at the United States mints in the mid 1800’s was to keep striking coins until the dies literally fell apart. The coin in Figure 2 was struck from the same reverse die as the coin in Figure 1, but in what must have been a terminal die state. The coin in Figure 2 was purchased by dealer Rich Uhrich at the November Whitman show in Baltimore and was last seen in his inventory. Both coins are dated 1856.